I could probably eat this for breakfast every morning and not get sick of it. It's great on its own, with some almond milk (or any other kind of milk) or mixed in with some plain greek yogurt that's been sweetened with a touch of raw honey. I highly recommend making large batches of this because it has a way of disappearing. In a large mixing bowl, combine oats, hazelnuts, coconut, almonds, pepitas, cinnamon, cardamom and salt. Mix together so that the spices have coated everything nicely. This prevents you from getting over-spiced clumps once you add the wet ingredients. Next add the olive oil and coconut oil. Mix to coat everything in the oils. Add the maple syrup and honey, drizzling it all over the top semi-evenly.. will just make the mixing easier. Mix all the ingredients together so that everything is evenly coated in the oils, honey and maple syrup. At this point, feel free to take a little taste. If you think it needs a touch more salt, feel free. I always taste for salt because I love the salt/sweet flavor combo. Line a half sheet pan (13"x18") with parchment paper. Empty contents of the mixing bowl onto the parchment paper and smooth into an even layer. Bake at 325 for 16 minutes, turning the tray at the 8 minute mark. Once the 16 minutes are up, lower the oven heat to 300, take the tray out and scatter the cranberries over the top so they aren't all clumped together. Adding the cranberries at this point ensures that they don't burn, but cook just long enough to get nice and chewy. Put the granola back into the oven and bake at 300 for another 10 minutes. Remove the tray, mix everything around, smooth it out again and put it back in for another 10-15 minutes, depending on your oven. 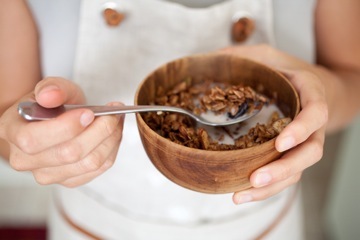 When the granola is ready to come out, your kitchen will be noticeably fragrant and the granola will be a nice, deep, golden brown. My oven has some hot spots so I tend to watch the granola really closely and take it out, mix it around about every ten minutes. Otherwise the corners and edges can burn. If you don't know your oven very well, I suggest keeping a watchful eye on the granola throughout the baking process. Allow the granola to cool on the baking sheet. Once cool to the touch, transfer to a couple of large mason jars with lids to keep the granola fresh. It'll stay fresh like that, just sitting on your kitchen counter, for a week or two.. but I doubt there will be any left at that point.